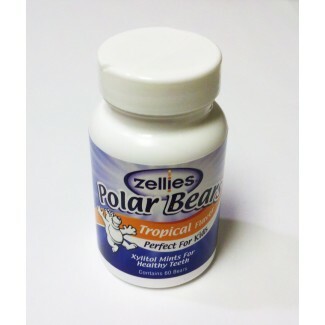 Zellies Junior Tropical Fruit Polar Bears are melt-in-your-mouth candies made with the finest european birch xylitol. Zellies Junior Tropical Fruit Polar Bears are All-Natural and do not contain any artificial sweeteners, colors or flavors (that’s why we’ve made them pure white Polar Bears!). Each Polar Bear contains 2.0 grams of xylitol. To have sufficient xylitol for ultimate oral health, eat 1 bear 3 times a day after meals and snacks. One 60 ct. jar is approximately a 3 week supply for one person. Studies show that to get rid of cavity infection you need around 5-10 grams of xylitol each day in 3-5 exposures for maximum dental benefit. Other studies show that for small children, regular xylitol at lower doses will prevent and stop cavities. – Grandma Zellies choice for her grandchildren! Visit Zellies.com to order your Zellies Polar Bears today!